With two Golden Gloves titles under her belt, Maureen O’Brien is flying high. The 30-year-old Dorchester native won the Lowell Golden Gloves on February 15 in the light welterweight division. After a lot of running, sparring, being in the gym and doing pad work with her trainer, she was ready for victory. “It’s a little more intense because you’ve got your sights set on getting ready for that and winning,” she said. Two other notable Grealish gym veterans came up big at the 67th annual competition held at the Lowell Auditorium. Daniel Higgins and Ramon Rodriguez both won their respective bouts. Now a resident of Hull, O’Brien travels back to her hometown daily to the Grealish Boxing Club and Fitness center to train with owner Martin and a familiar face: her father, John. Boxing runs through the 30-year-old’s veins. 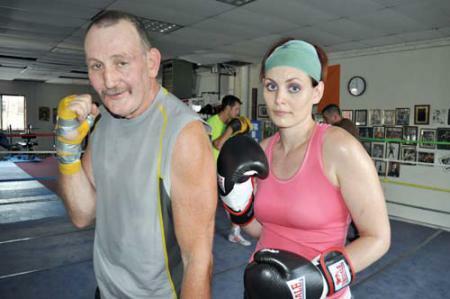 John has been boxing for nearly 40 years and imparts his wisdom on his daughter. John’s grandfather, an Irish immigrant, got him into boxing when he was a kid. He started training at the Quincy Boxing Club, but has trained at many gyms since, including the Somerville Boxing Club, Arlington’s Boston Sport Boxing Club in the 1990s, and now at the Grealish gym. In addition, he has taught boxing at BU for 13 years. Both John and Maureen train and teach at the Freeport St. facility. She currently teaches a women’s boxing and fitness class on Mondays and Thursdays, showing students boxing basics and conditioning techniques including punches, the basic boxing stance, sit-ups and pushups. O’Brien also works as a personal trainer at Boston Sports Club where her boxing specialty helps set her apart from other trainers, she says. “She picked it up pretty easy,” John said of his daughter getting into the sport. O’Brien remembers sitting on her father’s lap, watching matches on TV. With John as her main influence, it became a big part of her life. She took up taekwondo when she was 7 and went on to compete with three national teams. A leg injury steered her more toward boxing. Though she is following in her father’s footsteps, and though they both have a good jab, O’Brien is paving her own way in the boxing world. The now two-time champ trains hard and fights hard, but stresses that safety is a big factor when training to get in the ring. Since her last fight was her tenth, she can now compete as an open fighter. Her next goal is to join a national boxing team.